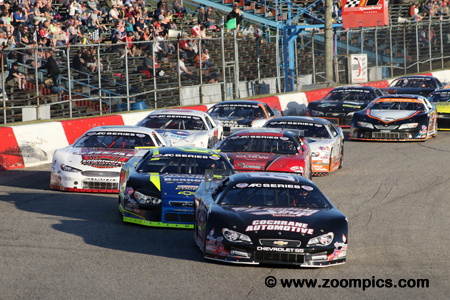 The APC United Late Model championship for Pro Late Models debuted in 2015. As evidenced by its growth, the Ontario series has proven to be very popular with competitors and fans. 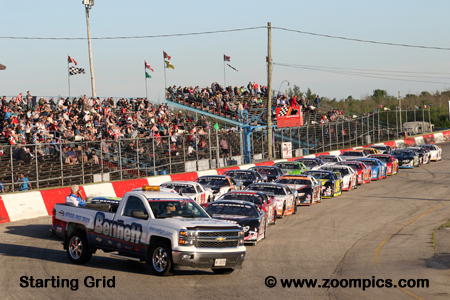 The 2018 season kicked off on the Victoria Day Weekend at Sunset International Speedway. 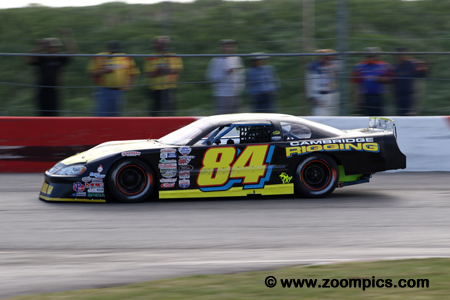 In June the teams would make their way to Flamboro Speedway, Peterborough Speedway and Delaware Speedway. The following month the series would make a second visit to Flamboro. 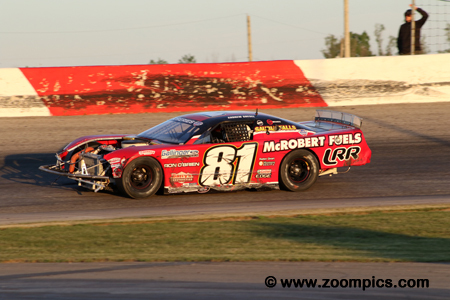 In August the drivers and their crews would visit Sauble Speedway and return to Sunset. The penultimate round would be held a Jukasa Motor Speedway on the Labour Day weekend with the finale taking place at Delaware Speedway. The series cars are constructed to specifications and rules common to most stock car series. The chassis is a tube frame covered with fiberglass bodies. Depending on the engine choice a car can weigh as much as 2800-lbs. Crate motors from General Motors (GM 604 & GM 602) and Ford (347) are used in the series. To regulate expenses, competitors use a spec tire from American Racer and Bilstein A2 shock absorbers. There are also rules which restrict the options available for transmissions, ignition components, body material, brakes, etc. Cars that qualify in positions one to ten are inverted according to points and season attendance. Before each race, the cars are fitted with a new set of tires, receive a technical inspection and are impounded until the start of the event. 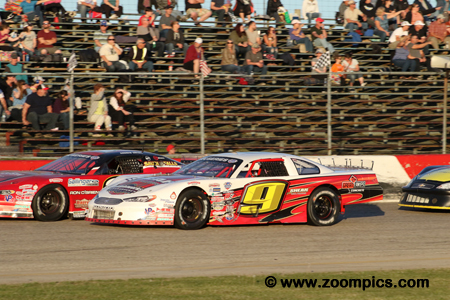 Round two of the APC Series nine-race season took place at Flamboro Speedway. Drivers would compete on the 1/3-mile semi-banked asphalt oval for 100-laps in the Interstate Batteries 100. 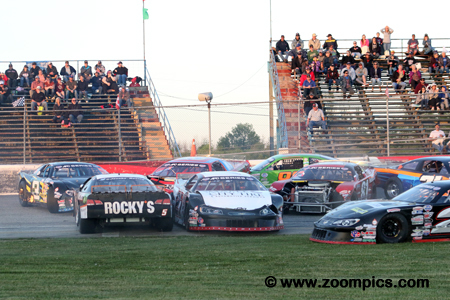 A field of twenty-four starters took the green flag in the Interstate 100 at Flamboro Speedway. Leading the way is Ryan Kimball in the Landing Strip sponsored Chevrolet. Behind Kimball is another Chevrolet driven by the other front row starter, Shawn Chenoweth. Trailing these two are former champions, Andrew Gresel (2016) and Brandon Watson (2017). 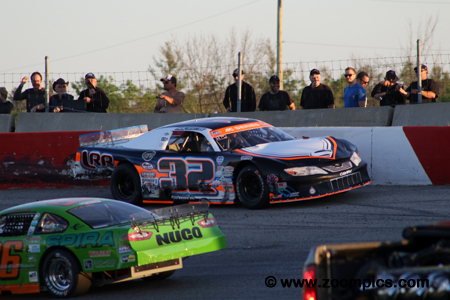 Four of the top-five finishers in the season opener at Sunset Speedway were penalized. The one driver making it through the tech shed was J.R. Fitzpatrick. 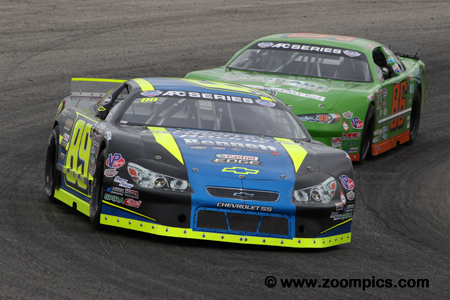 Fitzpatrick driving the Cambridge Rigging Chevrolet was the second-fastest qualifier and started ninth. On the final restart, he found himself behind Brandon Watson. Going into the first corner, Fitzpatrick pushed Watson wide and grabbed the lead and victory. Seeking redemption after being penalized in round one, Brandon Watson recorded the fastest qualifying time and set a new lap record. The No. 9 Ford Fusion was gridded fourth but Watson wasted little time moving to first place. 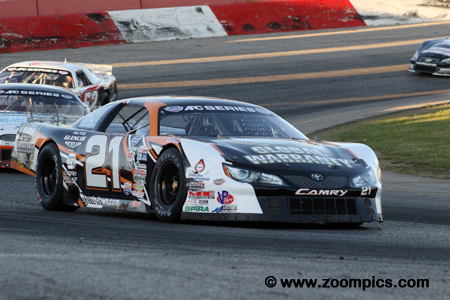 He was in lead after the final caution but on the restart J.R. Fitzpatrick moved him up the track and made the pass. This caused Watson to lose two positions but he fought back for a runner-up finish. It appeared that Matt Pritiko would be one of the beneficiaries of J.R. Fitzpatrick’s aggressive pass on Brandon Watson. Pritiko driving the Wix Filters Canada sponsored Toyota Camry tucked in behind Fitzpatrick after he pushed Watson out of the way. Watson was unable to move back onto the racing line and Pritiko grabbed second. However, Watson charged back and demoted Pritiko to a third-place finish. Shawn Chenoweth driving the No. 89c Chevrolet qualified fourth quickest. The draw to determine starting positions put Chenoweth on the outside of the front row. Despite an early pit-stop, he remained in contention. 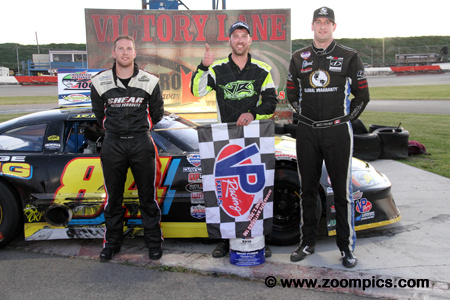 When J.R. Fitzpatrick moved Brandon Watson out of the groove, Chenoweth and Matt Pritiko slipped by, however, Watson was able to regain the position leaving Chenoweth fourth at the finish. 2016 series champion Andrew Gresel was gridded third for the start on the Interstate Batteries 100. On lap-52, he was third in the No. 81 Ford Fusion when Treyten Lapcevich got a run on him. Lapcevich was ahead when the two made contact, sending Lapcevich into the wall and causing damage to the front of Gresel’s Ford. Gresel was able to continue and finished tenth. Third generation driver, Treyten Lapcevich started round two of the APC championship in seventh grid position. The driver of the London Recreational Racing sponsored Toyota Camry moved into third place on lap-52 but contact on the back straight with Andrew Gresel took the series’ youngest driver out of contention. At the checkered flag, Lapcevich was in seventh place. On lap-68 the leaders caught the Chevrolet of Paighton Jacobs. Brandon Watson hit Jacobs causing her to spin in front of the field. An accordion effect occurred mid-pack which resulted in a track blockage. Those involved – Jacobs, Hudson Nagy, Andrew Gresel, Billy Schwartzenburg, Rick Spencer-Walt, Junior Farrelly and Mat Box - were able to continue. The top-three finishers for the Interstate Batteries 100 at Flamboro Speedway. In the center is J.R. Fitzpatrick who captured his first APC series victory driving the Cambridge Rigging Chevrolet. To Fitzpatrick’s right is the runner-up and defending APC series champion, Brandon Watson. And, rounding out the top-three is the driver of the No. 21 Toyota Camry, Matt Pritiko.